This document was created using OS X 10.10 Sierra. 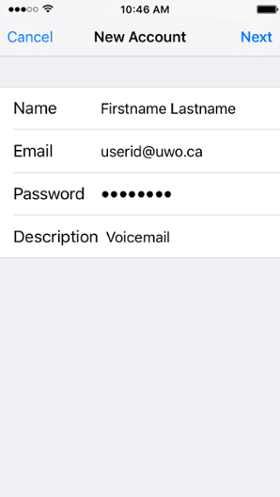 This How Do I... will walk you through setting up of the iPad, iPhone or iTouch to access your Western voicemail account. 1. You begin on the Home screen of your device. 2. The Setting screen should appear. 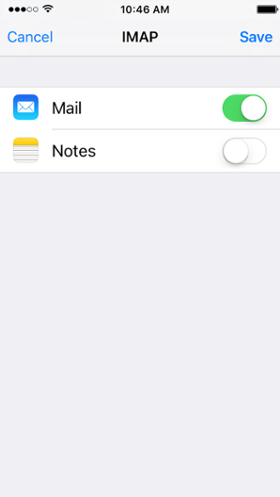 On the Settings screen, scroll down and tap Mail. 3. The Mail screen should appear. On the Mail screen, tap Accounts. 4. On the Accounts screen tap Add Account. On Add Account scrren, tap Other. 4. The Other screen should appear. 5. The New Account screen should appear. On the New Account screen, you need to complete the Name, Address, Password and Description fields. In the Name field, enter your first name and last name, as you wish it to appear on your emails. In the Password field, enter your Western Identity i.e. the password you use to access your email. Note: If you are running the current version of firmware, your password letter will display momentarily as you type so you can verify it is correct. In the Description field, enter Voicemail . When you have entered all of your information, tap Next. 6. The New Account screen will refresh. 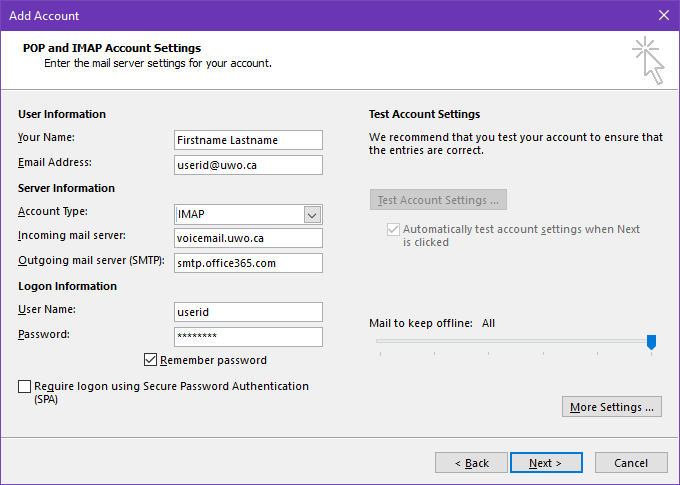 Ensure IMAP is selected at the top of the configuration screen. 7. Scroll to the Incoming Mail Server Section. Tap Password and enter your Western Identity password. Note: If you are running the current version of firmware, your password letter will display momentarily as you type so you can verify it is correct. 8. 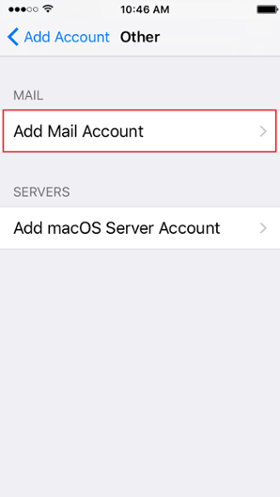 Scroll down to the Outgoing Mail Server section. Tap Password and enter your Western Identity password Note: If you are running the current version of firmware, your password letter will display momentarily as you type so you can verify it is correct. 9. Tap Next and your information will be verified and the final screen should appear. Your device is now configured to access your Western Voicemail. ­This document was created using OS X 10.10 Sierra. 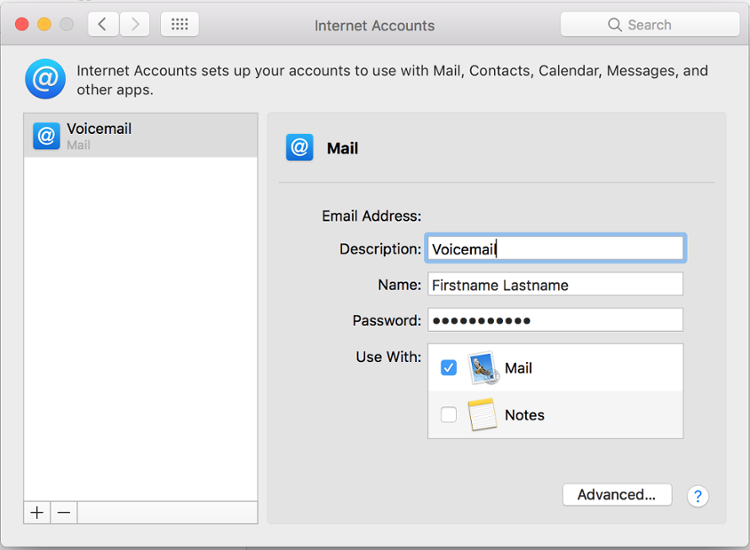 This How Do I... will walk you through setting up MacMail to retrieve your Voicemail messages using an IMAP profile. 1. 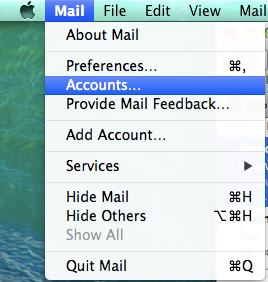 You begin by opening MacMail. Click on Mail and then tap Accounts... from the dropdown menu. The Internets Accounts screen should appear. 3. 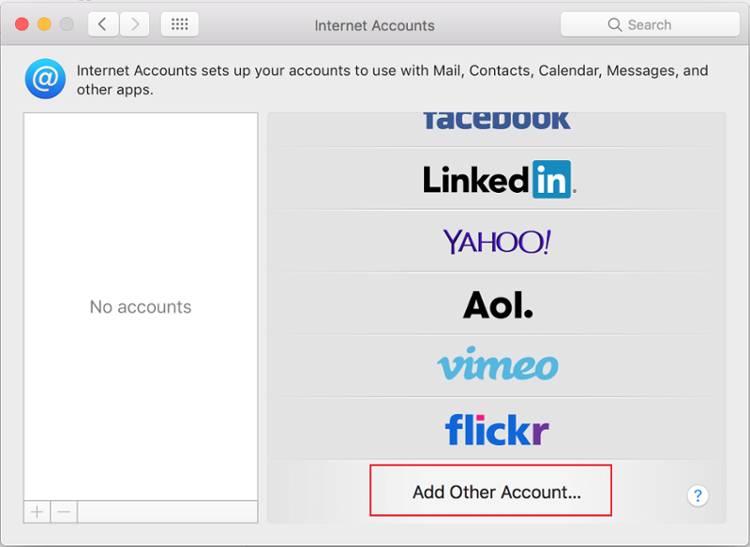 When asked to Choose an account type, select Mail Account. 4. The Add a Main Account screen should appear. Enter your name, Western email address and your password. 5. The Incoming Mail Server Info screen should appear. 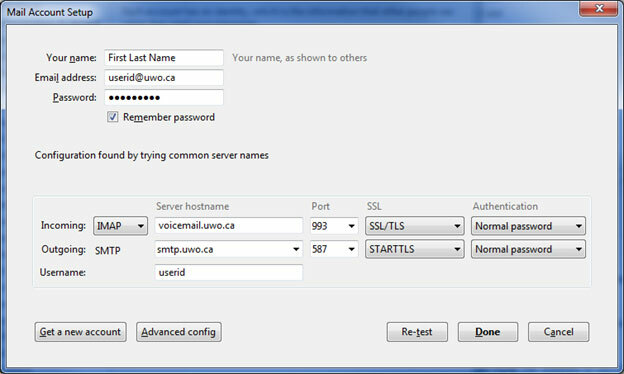 Enter voicemail.uwo.ca for the Mail Server, then enter your Western username and password. 6. 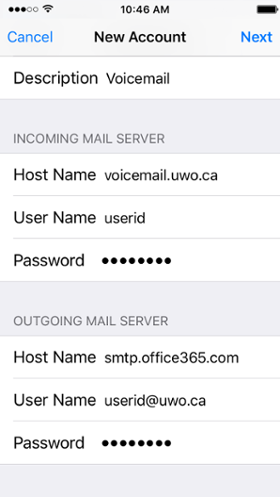 Enter smtp.office365.com for the SMTP server, then enter your Western username and password. 7. Uncheck Notes and click Done. 8. 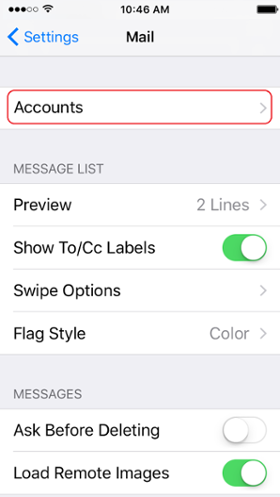 A screen should now appear that lists your accounts. 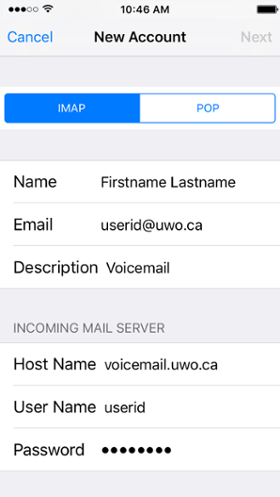 Select your new IMAP account from the list and change the description to Voicemail. 9. Your voicemail inbox will now show in your list of Mailboxes. 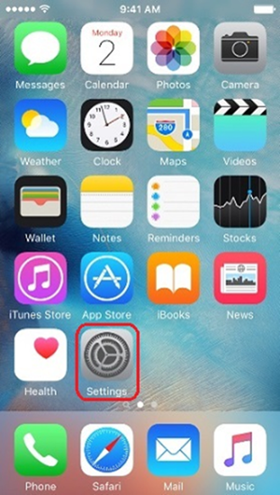 Your voicemail messages will now appear here. 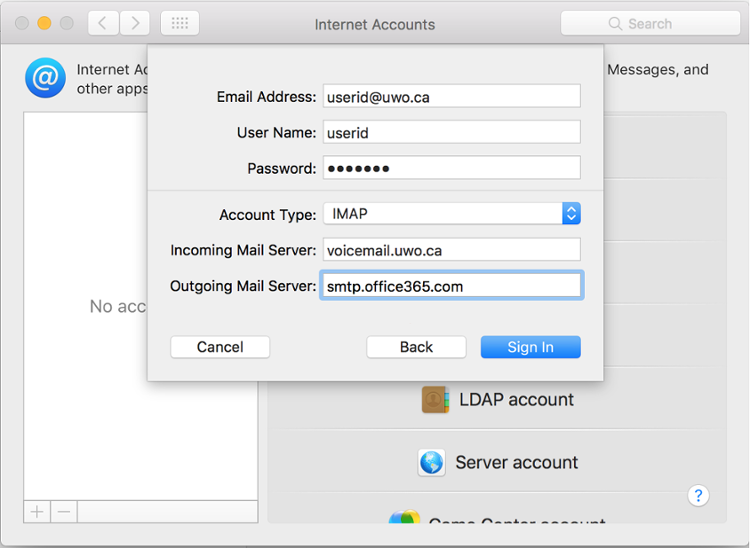 Mac Mail is now configured to access your Western Voicemail. 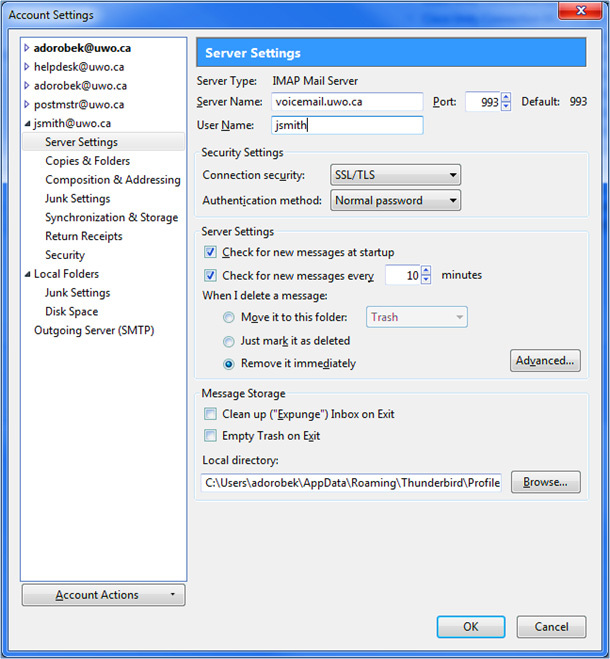 Configure Thunderbird - Explains how to configure voicemail to email on Thunderbird. This How Do I will walk you through the setup of Thunderbird (which is available as a free download at https://www.mozilla.org) to retrieve your Voicemail messages using an imap profile. The Mail Account Setup window will open next. 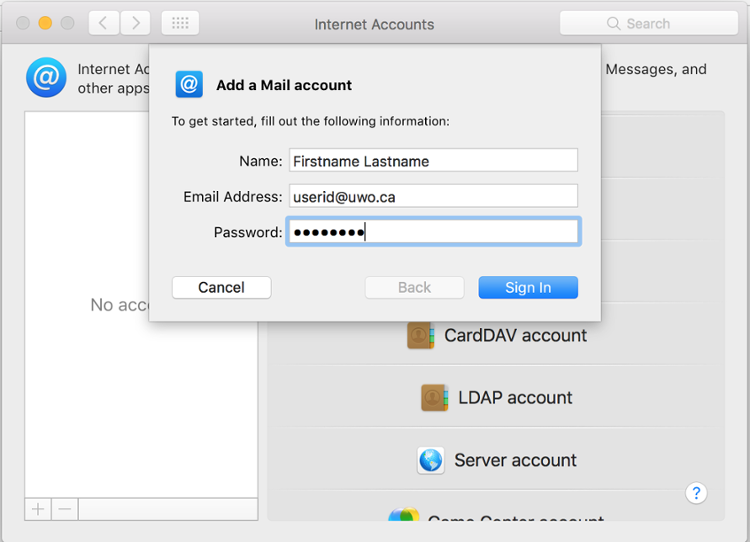 Enter your name, Western email address and Password in the appropriate fields. Click Continue. 2. On the next screen, DO NOT click DONE. Click on the Manual config button instead. 3. 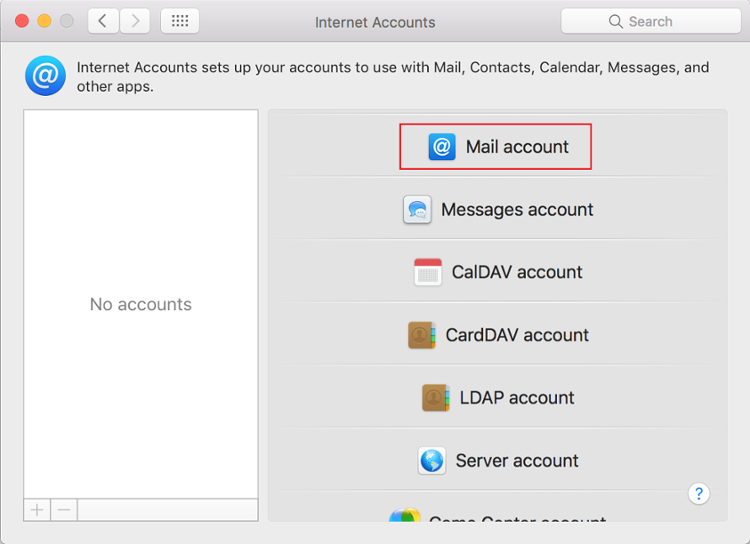 The Mail Account Setup window will open. NOTE: Since this account comes with INBOX only, the recommended setting for deleted messages is to remove them immediately. 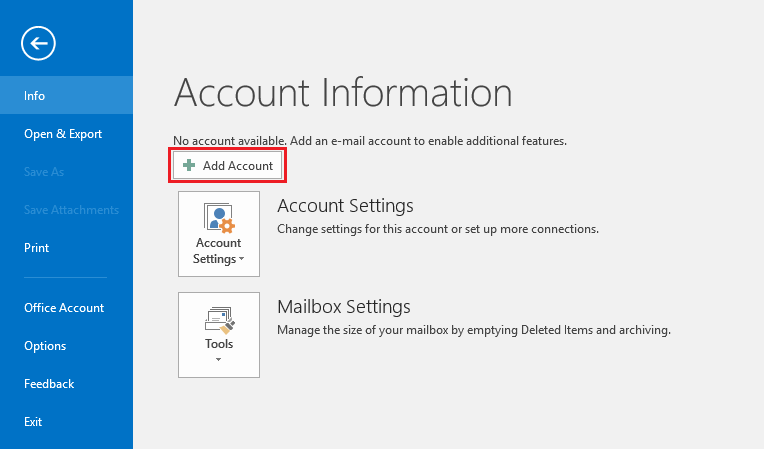 Access the Account Settings for the account you just configured. 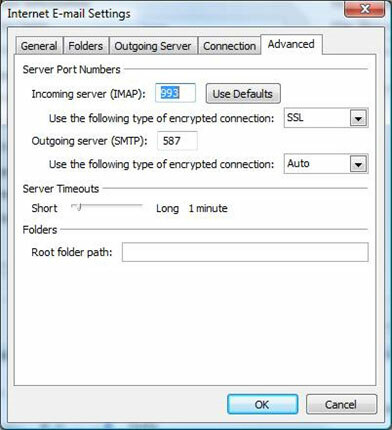 Click on Server Settings in the left pane. In the right pane, under When I delete a message:, select the option Remove it immediately. 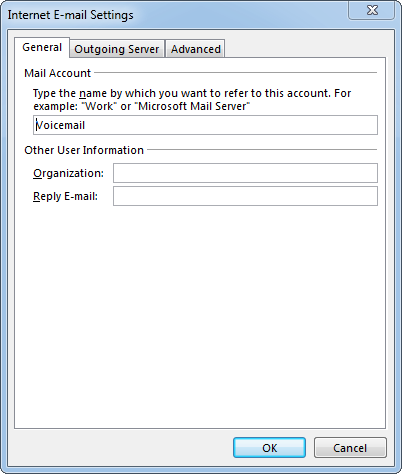 Configure Outlook 2007 - Explains how to configure voicemail to email in Outlook 2007. 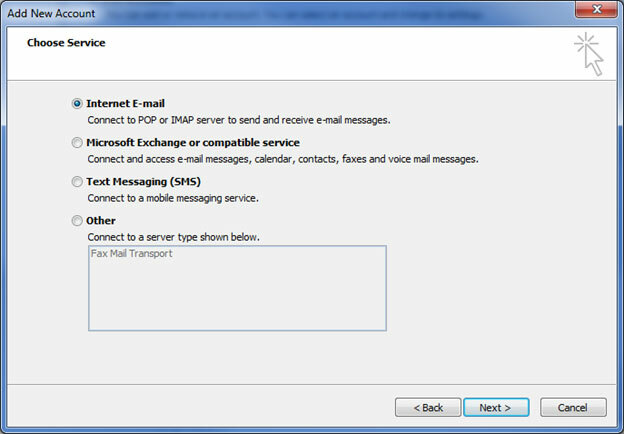 This How Do I will walk you through setting up Outlook 2007 to retrieve your Voicemail messages using an IMAP profile. NOTE: If this is the first time running Outlook it will start a setup configuration wizard. 2. 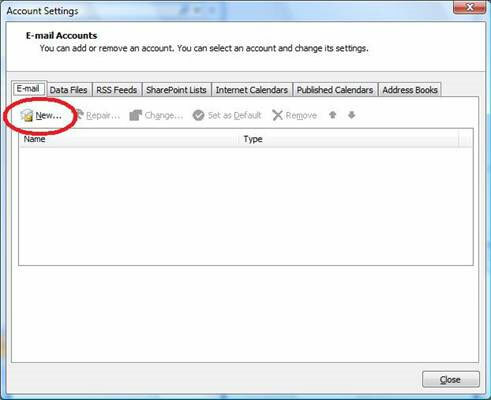 Click Tools and then choose Account Settings. The account settings configuration window will open. 3. With the Email tab selected, click New. This will open the “Add new email account” configuration window. DO NOT enter any information on this screen. 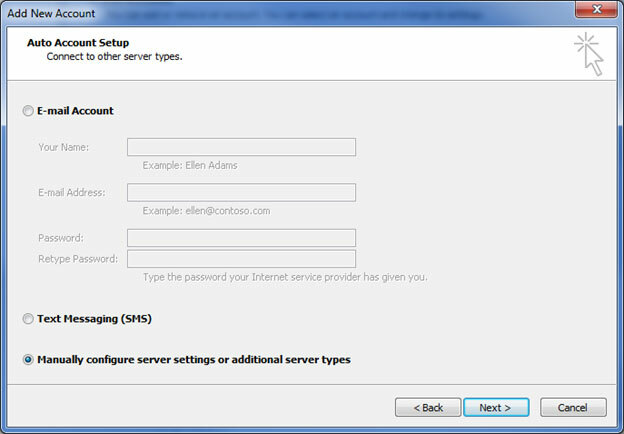 Instead, click on the check box next to Manually configure server settings or additional server types and click Next. 4. 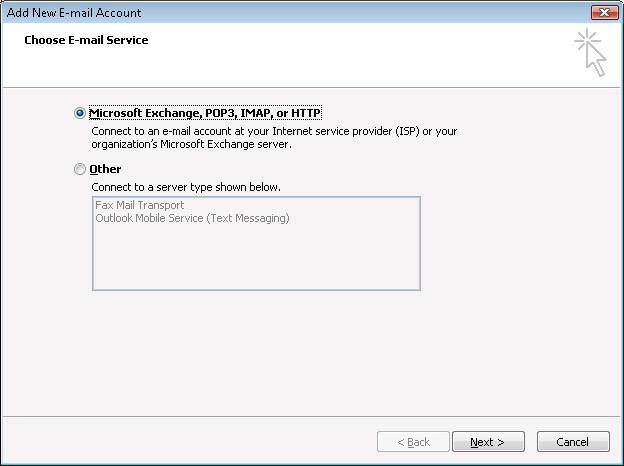 Select Microsoft Exchange, POP3, IMAP, or HTTP as your Email Service and click Next. 5. The Internet Email Settings screen should appear. 6. 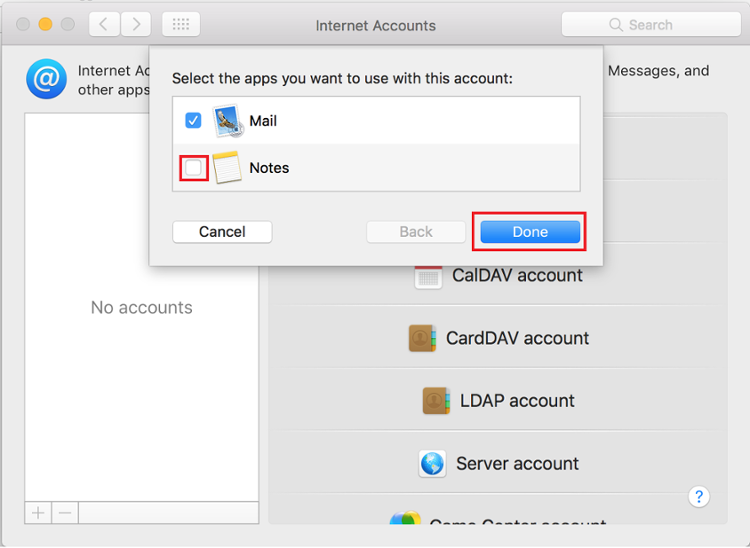 The Internet Email Settings window with tabs (General, Folders, Outgoing Server, Connection and Advanced) should open. 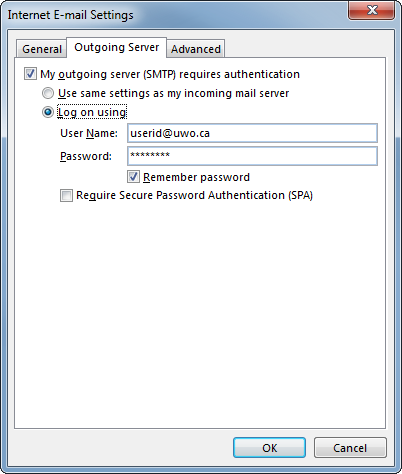 Check off My outgoing server (SMTP) requires authentication and ensure Log on using is selected. 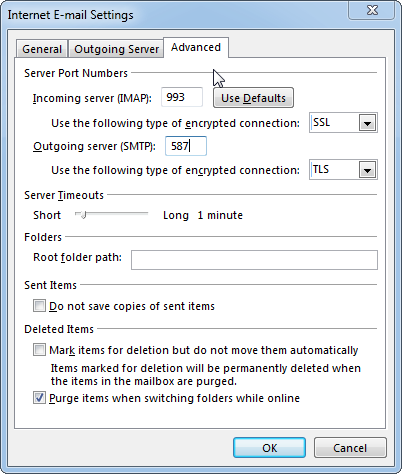 NOTE: Outgoing server (SMTP) ports available for this connection are 587 or 465. Some of Internet Service Providers are deliberately blocking some ports. 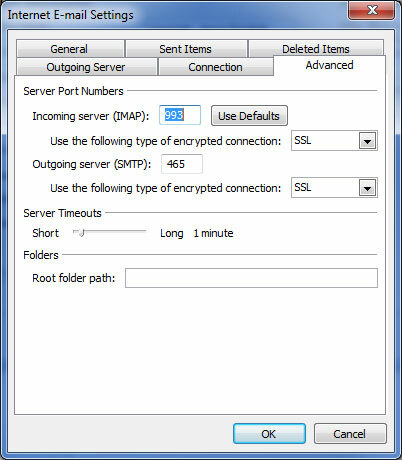 If your computer cannot make SMTP port connection with one of the ports, please try the other one. 7. This will take you back to the Internet Email Account Settings screen. You have now configured Outlook 2007 for Western email. 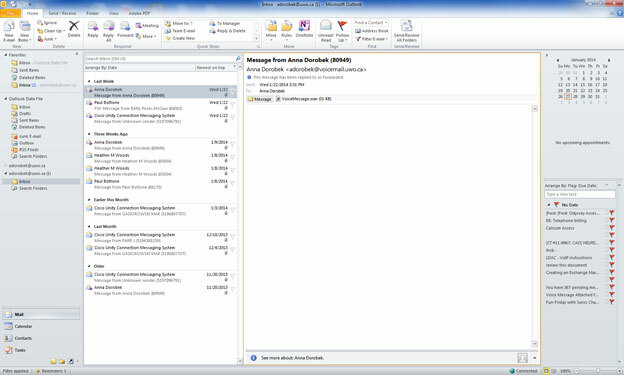 Configure Outlook 2010 - Tells you how to configure voicemail to email on your Outlook 2010. 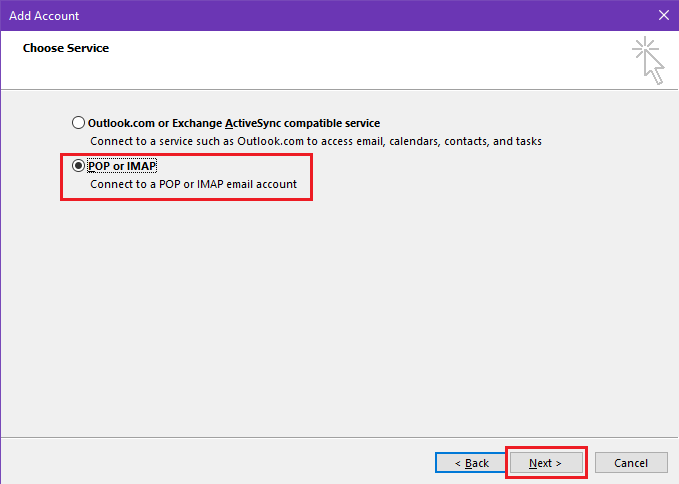 This How Do I will walk you through setting up Outlook 2010 to retrieve your Voicemail messages using an IMAP profile. Click File and then Account Settings. The Account Settings configuration window will open showing several tabs. 2. With the Email tab selected, click New. This will open the Add New Account window. Select Email Account as your Email Service and click Next. 3. This will open the Add New Account configuration window. DO NOT enter any information on this screen. 4. The Choose Service window will open. 5. The Internet E-mail Settings configuration window will open. 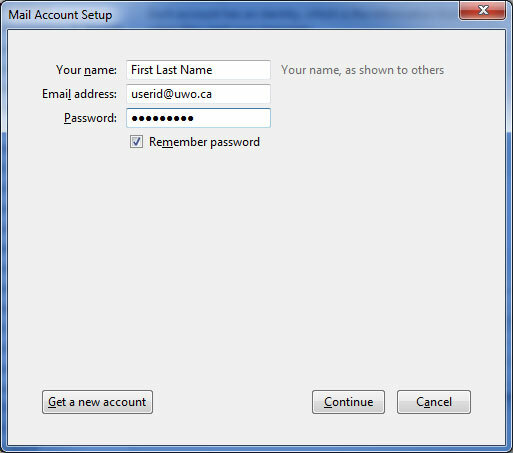 Enter your Western username and password (click Remember password if you don’t want to enter your password every time you start Outlook). 6. The Internet E-mail Settings window with several tabs will open. On the Outgoing Server tab, check the check box next to My outgoing server (SMTP) requires authentication and ensure Log on using is selected. You have now configured Outlook 2010 for Western email. 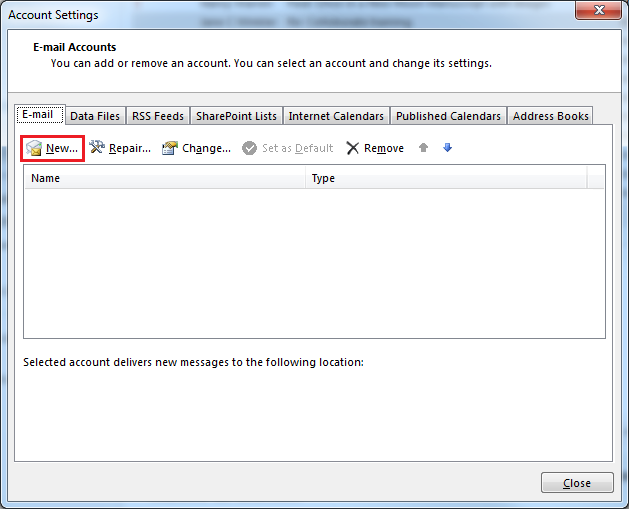 Configure Outlook 2013 and 2016 - Explains how to configure voicemail to email on your Outlook 2013 and 2016. 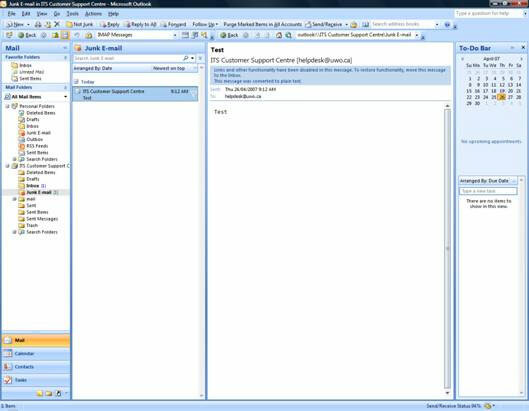 This How Do I will walk you through setting up Outlook 2013 and 2016 to retrieve your Voicemail messages using an IMAP profile. 1 Open Outlook. Click on the File tab in the top left hand corner. 2. The Account Information window will open. Click on the Account Settings button and chooses Account Settings... from the dropdown. 3. The Account Settings window will open, showing several tabs. 4. The Add Account window that will allow you to Choose Service will open. Select the POP or IMAP option and click Next. 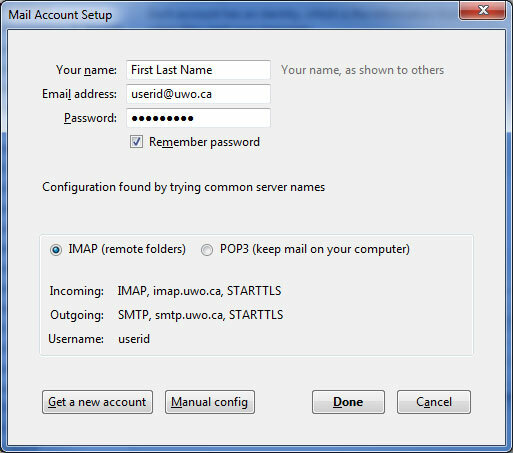 The POP and IMAP Account Settings window will open. 5. Under User Information, enter your name and Western Email address. Click on the More Settings ... button. 7. 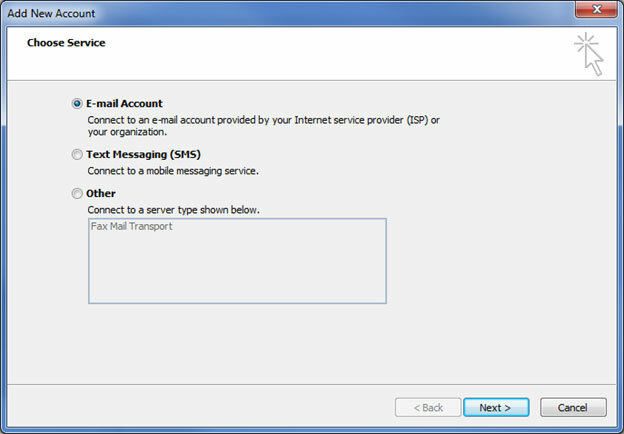 The Internet E-mail Settings window will open, showing three tabs, General, Outgoing Server and Advanced. 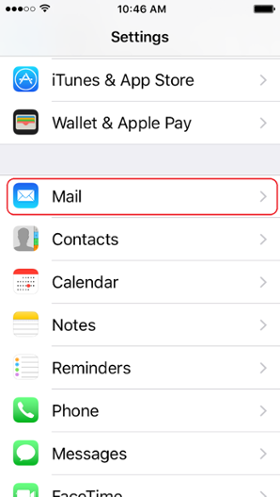 On the General tab, change the Mail Account description to Voicemail. 8. 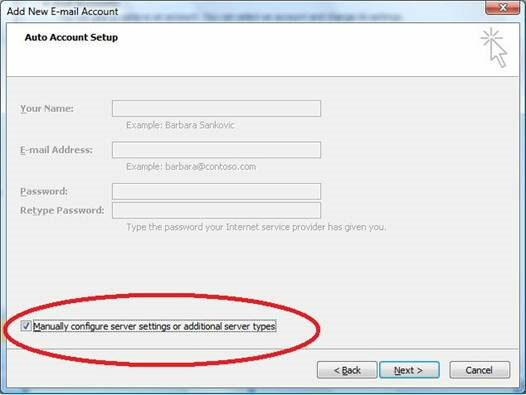 On the Outgoing Server tab, check the check box next to My outgoing server (SMTP) requires authentication and ensure Log on using is selected. 10. 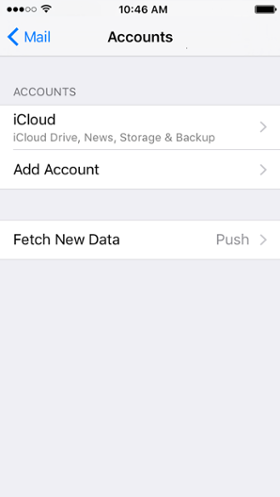 You should return to the POP and IMAP Settings window. Click Next. Outlook will test the settings you have just configured. You will now have a Voicemail Inbox where your messages will be delivered to. Outlook is now configured to access your Western Voicemail.